Toronto Public Library (TPL) (French: Bibliothèque publique de Toronto) is a public library system in Toronto, Ontario. It is the largest public library system in Canada and in 2008, had averaged a higher circulation per capita than any other public library system internationally, making it the largest neighbourhood-based library system in the world. Within North America, it also had the highest circulation and visitors when compared to other large urban systems. Established as the library of the Mechanics' Institute in 1830, the Toronto Public Library now consists of 100 branch libraries and has over 12 million items in its collection. The first subscription library service to open in the city was on 9 December 1810, at Elmsley House. During the Burning of York in April 1813, several American officers under Commodore Issac Chauncey's command looted books from the library. Discovering his officers were in possession of the stolen books after they returned to Sackets Harbor, Chauncey ordered the looted books returned to York. The stolen books were returned in two crates, although by the time the time they arrived, the library had already closed. The books were auctioned off in 1822. 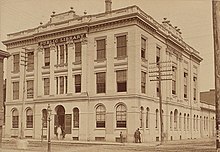 The Toronto Mechanics' Institute in 1884. A library was established at the Institute in 1830, whose collection was later absorbed into the Toronto Public Library in 1884. In 1830, a library was established in the York Mechanics' Institute. In 1882, the provincial legislature passed a free libraries act. In 1884, the Mechanic's Institute's collection became the Toronto Public Library. James Bain was the first chief librarian and he supplemented the collection with $15,000 worth of books purchased on a trip to England in late 1883. Between 1907 and 1916, ten libraries were built with funds from the Andrew Carnegie Trust. Several of these Carnegie libraries continue to be used by the public library; one, the original Central Reference Library, is now the Koffler Student Centre at the University of Toronto. Henry Cummings Campbell was Chief Librarian of the Toronto Public Library from 1956 to 1978, and the first Chief Librarian to hold a professional library degree. He is credited for having contributed to the expansion of the library and its adaptation to an increasingly dynamic and multicultural city. The Toronto Reference Library was merged with the other library boards of Toronto following Metropolitan Toronto's amalgamation in 1998. This made the Toronto Public Library the largest library system in North America, serving a population of 2.3 million people with 98 branches at the time. In 2004, a new library was opened in the St. James Town neighbourhood of Toronto, bringing the total number of branches to 99. In 2014, the city’s 100th library was constructed and opened in Scarborough City Centre. The Toronto Public Library is governed by a Board appointed by Toronto City Council. The Board is composed of eight citizen members, four Toronto City Councillors and the Mayor or his designate. The Lillian H. Smith branch of TPL holds the Merril Collection of Science Fiction, and the Osborne Collection of Early Children's Books. The library's collection count is approximately 11 million items. Toronto Public Library's special collections is located in several branches throughout the city. A number of special collections are housed at the Marilyn & Charles Baillie Special Collections Centre in the Toronto Reference Library. Special collections at the reference library includes the Arthur Conan Doyle Collection, and the Baldwin Collection of Canadiana. Special collections located at other branches of the Toronto Public Library Merril Collection of Science Fiction, and the Osborne Collection of Early Children's Books, located at Lillian H. Smith branch. The Rita Cox Black and Caribbean Heritage Collection is spread throughout four branches of TPL, Malvern, Maria A. Shchuka, Parkdale, York Woods branch. The Toronto Public Library operates two bookmobiles. The TPL operates two Bookmobile buses (24' Blue Bird CS), targeting communities who lack easy access to a neighbourhood branch. There are 32 regular Bookmobile stops in Toronto, including one on Ward's Island. The bookmobile concept was previously used in the library systems of the former municipalities of North York and Scarborough as well as in Toronto as far back as 1948. Since April 2016, the Parkdale branch has a collection of musical instruments including guitars, violins, keyboards, percussion instruments, and others that you can borrow for free with your library card. The residents of Toronto can borrow museum passes with their library card. Each pass allows maximum 2 adults and 4 kids entering one site. Passes are distributed on a first-come, first-served basis. Passes for popular sites, such as the Toronto Zoo, the ROM (Royal Ontario Museum) and the Ontario Science Centre, may require waiting in line. The Toronto Public Library technology services include public access computers and free wireless internet access in all branches. The Library also provides access to e-books, music, movies, and other electronic collections. The Toronto Public Library website allows users to reserve materials and have them transferred to the user's preferred branch. The library also operates a Dial-a-Story telephone hotline, which reads stories to children in sixteen languages. Eight branches of the Toronto Public Library also house Digital Innovation Hubs, where patrons can reserve a workstation or equipment and attend workshops to bring new and emerging technology to the community. Toronto Public Library cardholders can digitally borrow books, music and movies since 2014 by creating an account on the online platform Hoopla. Also, since 2018, the Toronto Public Library has partnered with Kanopy, a free streaming platform with over 30,000 films and documentaries, that lets the library users stream up to eight items per month after registering using their library card. The library's Digital Archive provides instant access to historical images—including photographs from the Toronto Star Photograph Archive—postcards, maps, rare digitized books and more. The Toronto Public Library offers audiobook, e-book, and eMagazine services, including OverDrive eBooks & eAudiobooks, Zinio eMagazines, OneClick Digital eAudiobooks, Safari Tech & Business Books Online, TumbleBook Library, Ebsco eBooks, delivered via the library's website. ^ a b Pelley, Lauren (20 May 2015). "Toronto Public Library opens 100th branch in Scarborough". Toronto Star. Retrieved 20 May 2015. ^ "2015 Key Facts". Retrieved 1 March 2017. ^ a b "2015 Annual Report" (PDF). Retrieved 1 March 2017. ^ "Toronto Facts: Diversity". Retrieved 1 March 2017. ^ "2015 Finance Reports : Library Finance". ^ "The Great Equalizer: Toronto Public Library". Cities of Migration. April 16, 2013. ^ a b "2009 Annual Performance Measures and Strategic Plan Update" (PDF). Toronto Public Library. Retrieved 4 June 2010. ^ Kupferman, Steve (28 May 2014). "Fort York gets the ultimate condo amenity: a flashy new public library". Toronto Life. Toronto Life Publishing Company. Archived from the original on 29 May 2014. Retrieved 29 May 2014. ^ "Message from the Mayor" (PDF). Toronto Public Library Strategic Plan 2000-2008. Toronto Public Library Board. 2000. p. 4. Retrieved 7 August 2011. ^ "History of Toronto Public Library". Toronto Public Library. 2011. Retrieved 7 August 2011. ^ a b "War of 1812: The Battle of York". Toronto Public Library. 2019. Retrieved 12 April 2019. ^ Bruce, Lorne (9 January 1994). Free Books for All: The Public Library Movement in Ontario, 1850-1930. Dundurn. p. 72. ISBN 978-1459721074. ^ "Topics of the Week". The Week : A Canadian Journal of Politics, Literature, Science and Arts. 1 (2): 17. 13 Dec 1883. ^ 1948-, Murray, Stuart (2009). The library : an illustrated history. New York, NY: Skyhorse Pub. ISBN 9781616084530. OCLC 277203534. ^ "In Memoriam Henry Cummings Campbell" by Paula de Ronde, August 24th, 2009, Hart House, University of Toronto. ^ "City of Toronto Act, 1997, SO 1997, c 2". CanLII. Retrieved 2014-03-15. ^ "Scarborough Civic Centre Branch : Hours & Locations". ^ "Toronto Public Appointments Decision Body Profile". toronto.ca. Retrieved 2018-01-19. ^ "About the Library : Toronto Public Library". Torontopubliclibrary.ca. Retrieved 2014-03-15. ^ "Special Collections & Rare Books". Toronto Public Library. 2018. Retrieved 17 November 2018. ^ "Arthur Conan Doyle Collection". Toronto Public Library. 2018. Retrieved 17 November 2018. ^ "Baldwin Collection of Canadiana". Toronto Public Library. 2018. Retrieved 17 November 2018. ^ "Merril Collection of Science Fiction". Toronto Public Library. 2018. Retrieved 17 November 2018. ^ "Osborne Collection of Early Children's Books". Toronto Public Library. 2018. Retrieved 17 November 2018. ^ "Rita Cox Black and Caribbean Heritage Collection". Toronto Public Library. 2018. Retrieved 17 November 2018. ^ "Bookmobiles : Hours & Locations : Toronto Public Library". Torontopubliclibrary.ca. Retrieved 2014-03-15. ^ "History of Toronto Public Library : About the Library". Toronto Public Library. Retrieved 2018-01-19. ^ "Borrow a Musical Instrument : Toronto Public Library". Toronto Public Library. Retrieved 2016-04-20. ^ "Use Your Toronto Library Card to Visit Museums for Free". ^ "FAQ : How do I place a hold on the website?". Torontopubliclibrary.ca. Retrieved 2014-08-08. ^ "Digital Innovation Hubs : Using the Library". Toronto Public Library. Retrieved 2019-04-16. ^ Slaughter, Graham (7 April 2014). "Toronto Public Library launches Hoopla, Netflix-like movie and music service" – via Toronto Star. ^ "Stream free movies, tv shows and docs with Toronto Public Library's new service - Metro Toronto". ^ "Digital Archive". Toronto Public Library. Retrieved 2017-12-19. ^ "Downloads & eBooks : Books, Video, Research & More". Myrvold, Barbara (1986). In Peter F. McNally (ed.). Readings in Canadian library history. Ottawa Ontario: Canadian Library Association. pp. 65–89. ISBN 978-0-88802-196-0. Penman, Margaret (1983). A Century of Service :Toronto Public Library, 1883-1983]. Toronto: Toronto Public Library. ISBN 978-0-919486-73-7. Wikimedia Commons has media related to Toronto Public Library.